Create a playful environment with the pinwheel umbrellas and optional custom two-tone option. With many bright, fun colors available, creating an umbrella to match your facility will be effortless. 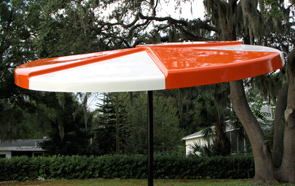 Constructed with solid fiberglass, umbrellas are 6' in diameter and are available with a powder-coated pole resistant to rust and corrosion. The commercial grade two-part (catalyzed) polyurethane paint process creates vibrant colors guaranteed not to crack, fade or peel. Choose from a 6' or 8' pole lengths in either white or black and straight or angled. Replacement umbrella poles are also available. Pair with the matching fiberglass round picnic table shown to create a perfectly matching outdoor table. Standard umbrella poles are tested to withstand winds up to 50mph or you can opt for the High Wind Upgrade for umbrellas that withstand winds up to 70mph. Fits over 42" Dia. Table Top. Heavy-Duty reinforced steel gussets manufactured into umbrella and thicker gauge (.125") steel umbrella pole. 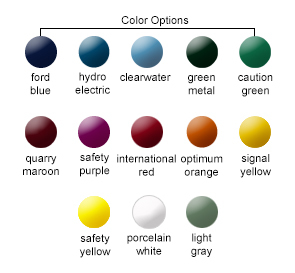 Select any combination to achieve the color match or complement any color scheme. Works best on the Bistro and Valance style umbrellas. Most commonly applied to outside edge but, can also be applied to top. Priced to include the application of 4 Logos. *Logo Set-Up Fee is a one-time fee. Your logo will be available to be used on future orders without paying another set-up fee. Logo Application fee will still apply on future orders. at least 300dpi at minimum size 15"x15"
Minimum size of 2"x 2"
i.e. files from the internet.